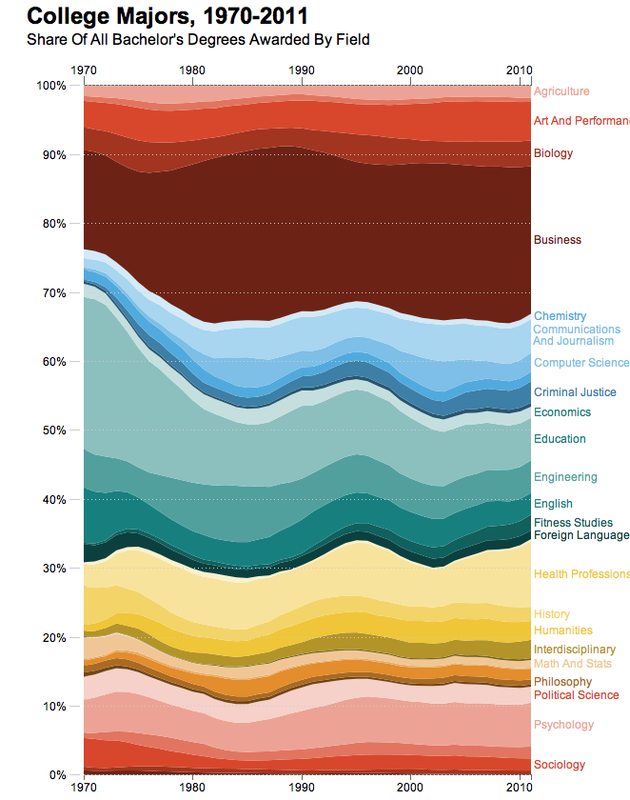 NPR’s Planet Money posted a wonderful graphic, tracking the popularity of various undergraduate majors. I wish I had thought to do this from basic data in the Digest of Education Statistics. Planet Money immediately pointed out the decline in education as an undergraduate major. The education degree saw a dramatic decline, falling from 21 percent of all graduates in 1970 to just 6 percent in 2011. Does this mean there’s a huge shortage of teachers? Not necessarily — it just means that far fewer students who go on to be teachers actually graduate with an education degree. According to the Department of Education, as recently as 1999 roughly two-thirds of new teachers graduated with an undergraduate degree in education. By 2009, that figure fell to just half. I’m wondering, how it important it is for teachers to have majored in education? I’ve always advised aspiring journalists to study the subject they want to write about. If you want to be a foreign correspondent, study world history, international relations or political science. You can learn newspaper writing on the job or go to grad school in journalism later. That would be great if more teachers are now studying the subjects they want to teach. Unfortunately, it doesn’t seem that future teachers are migrating from education to math and English. Both of those majors are going out of favor too.